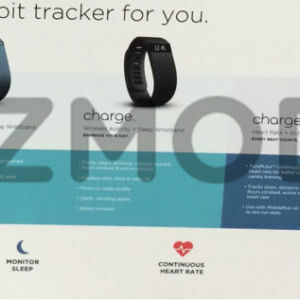 Gizmodo got their hands on some official-looking marketing materials that show a Fitbit Charge and a ChargeHR. The Charge seems to look like and have the features of the now-recalled Fitbit Force (recalled after some people experienced bad rashes and burns after wearing it). The Charge will track steps (distance, floors, etc. ), will display stats, time and caller ID, will monitor your sleep, has a vibrating alarm, and is water resistant. The Charge HR will monitor your heart rate too. Assuming the info is true, that feature would be entirely new for a Fitbit device. With this added functionality the HR will do everything the regular charge does plus monitor your pulse on your wrist continuously, work with MobileRun on the Fitbit app, will give you active minutes, and keep track of your 24/7 heart rate. The assumption is that Fitbit has found a way to make these devices without using nickel (the smoking gun on the Force). No solid info on the pricing, but they could be as high as $185 for the Charge and $220 for the Charge HR, but could be cheaper since the Force was $130. In other Fitbit news, this week reports have Apple pulling all Fitbit stock from their shelves. It could be because of Fitbit’s hesitation to integrate their tech with Apple’s Health app. Want everything you do online to be anonymous? Then you might need an ananoabox—an open-source router that runs all traffic through a Tor network. A Tor network encrypts the traffic and moves it around random computers across the globe, hiding the user’s IP address. Not only would this device make you anonymous on the web, it also allows users to avoid any government censorship ( China, Middle East). If you’d like one, the $45 pledge option is sold out, but they still have $51 options left. UPDATE: Anonabox has been suspended on Kickstarter. Wired has the story, but basically the creators have been accused of misrepresenting their product and all donations will be refunded. Lollipop, Google’s 5th mobile operating system, has a new look called “material design” giving it a fresh, clean feel. What else is new? Notifications have been refreshed with “Heads Up” ones that pop up at the top of the screen and give you a preview of your text/email/incoming call while you’re doing something else. You can also prioritize your notifications which looks like a handy feature. Multitasking is improved, with Chrome-like tabs so you can flip through and switch apps quickly. There are also new sharing options—a “guest mode” that will give access to only certain things, and if you have different user accounts, you can use a different Lollipop device to access the information on another. Oooh, and this is cool—Lollipop brings a Battery Saver mode which turns down the CPU and also turns off background data to help preserve the device’s power. More information about all the new features is summarized here http://www.cnet.com/products/google-android-5-0-lollipop/ . The new operating system will roll out on the Nexus 6 and Nexus 9, with others models to get the update in the coming weeks (reports are early November for some). In short, Apple released a new iPad Air 2, the iPad Mini 3, iMac with Retina display, OS X Yosemite, and promised iOS 8.1 (which will bring Apple Pay) for Monday. Here’s a few details: the iPad Air 2 is the thinnest iPad ever and has the next A8X chip so it’s faster too. Prices start at $499. With very few minor differences, the iPad Mini 3 is just like the iPad Mini 2 but with TouchID…but now it’s available in gold. Prices start at $399 (with the iPad 2 now only $299, you may want to go that route). The Retina iMac has a resolution of 5120 x 2880 – about seven times as many as you’d find in an HD TV. The Mac Mini also got a refresh with a 1.4 GHz dual core processor, 8GB of memory, and an Apple 1TB solid-state so-called fusion drive. Apple Pay will come on Monday, and more than 500 banks are signed up now to work with Apple Pay. Finally, Apple’s newest OS, Yosemite, arrived yesterday. It’s available as a free update. You might remember from your high school that the earth’s polarity sometimes…every 200,000-300,000 years…flips. The earth is actually behind schedule and it may take less time to change than ever thought. Gizmodo had the story. Remember Mr. Fusion, the device that replaced the Flux Capacitor in the DeLorean time machine? Well, Lockheed Martin is working on something not too dissimilar – a compact fusion reactor. Engadget has the scoop. Someone has developed a 3D-printed prosthetic hand, complete with light-up palm “booster” and voice control. The inventor wants to help kids and give them away for free (how superhero is that??). Mashable has the details.